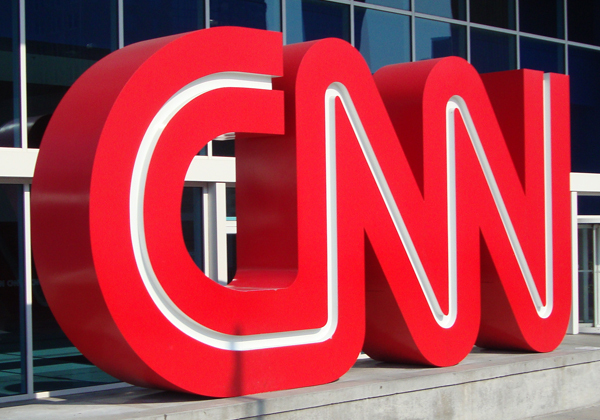 Cable News Network—or what we all know as CNN—brings world news to the entire globe and has done so since 1980. CNN's global headquarters are right here in Atlanta where visitors and locals have the unique opportunity for a behind-the-scenes look at how the news is generated, hosted and broadcast—the Inside CNN Studio Tour. Inside CNN tours are offered nearly every day of the year, are approximately one hour in duration and are led by very well trained, enthusiastic tour guides. The tour I went on today was hosted by JR, a studious-looking but charming young man whose impressive knowledge of CNN the company and its eight-story global headquarters made for an interesting sixty minutes (not to be confused with a different television news program). Tours begin approximately every 10 minutes, which is certainly not the case for most other tours in Atlanta...and an impressive beginning it is. We started our tour on what is the world's largest "freestanding" escalator. That means that the only supports it has are at the bottom and the top of the escalator—no other supports at all! We didn't learn that tidbit of information until later. 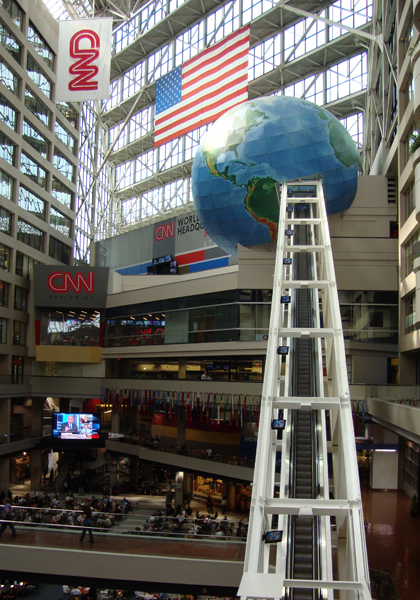 So, what does an escalator have to do with delivering the news? Nothing really, but it makes for a fun launch of a tour. At the top of the escalator we found ourselves inside a gigantic 50-foot globe, which represents all the points on the blue-green marble we call our home planet where CNN reports the news to and from. The first news-related stop on the tour was the Control Room, or rather a simulation of the real CNN control room located in another part of the building. It does however feature live feeds—audio and video—of a CNN News broadcast. JR explained how news directors instruct weather and news anchors, as well as camera operators and video technicians, during a live program and how the various screens in the Control Room are used to produce a program in real-time. Next, we were off to a mock weather reporting studio where JR described chroma key technology, or more commonly known as green screen technology. He also attempted to demonstrate how wearing clothing as the same color as the background could produce a "headless weatherman." But our particular group was not the laugh-out-loud type. Many in the group did eventually have questions, so it was mildly apparent that they were at least engaged if not humored. One of the more impressive stops on the tour was the CNN Overlook. JR discussed the various roles of the employees in the highly-populated, busy production and directing studio; who's responsible for prioritization; and, who approves content in the process of news-gathering and news sharing. I did notice that many of the hunters and gathers of the news were young people. Behind-the-scenes evidently has fewer "seasoned" staff members than one might assume. Totally cool...after all, it's about what you know and do well, not so much how long you've known it, right? We also were treated to views of program preparations for CNN International, HLN News and Views, and CNN en Espanol. We actually passed an anchor woman in the hall from CNN en Espanol who we later saw in the studio practicing for a live broadcast. Kept an eye out for Anderson Cooper, but no such luck. Also on the tour was a writers and editors studio, densely packed with computers and flat screen monitors. A member of our tour group asked, "How they could have possibly fit that many CRT monitors in the same space?" That was the one answer that eluded our tour guide. Now, what tour of any tourist attraction these days doesn't wrap up in the gift shop? The Inside CNN tour is no exception. I almost darted through the shop refusing to browse, but the life-size stormtrooper caught my eye. So, I actually did end up browsing for a couple of minutes. It's actually quite a nice little gift shop, one that has something for visitors of all ages…and it's considerably more than just t-shirts and branded shot glasses. Getting to CNN headquarters is relatively easy. 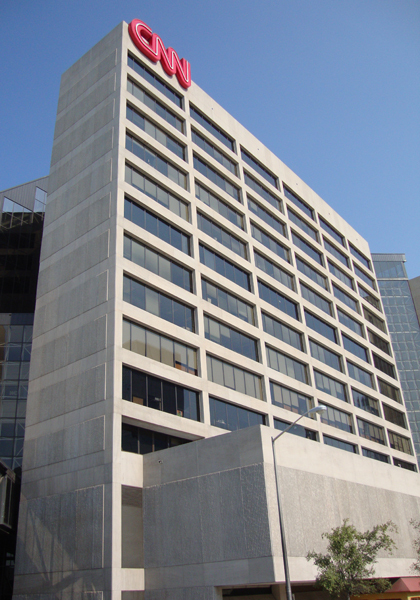 It's located very close to Centennial Olympic Park, Georgia Aquarium and the World of Coca-Cola, all near downtown Atlanta. There are numerous parking options in the area, including a parking lot specifically for CNN visitors. CNN offers various other tours, too. Some go into a lot more depth and grant access to other CNN studios. Information about the other tours, as well as group rates for all tours, is on CNN's website. You may have wondered why there are so few photos with this post, particularly the absence of any behind-the-scenes photos. CNN does not allow photography on their Inside CNN Studio Tour and given a recent slap on the wrist, I wasn't going to risk it. They're a pretty powerful outfit, one that I'd like to keep on my good side. Will I return for another Inside CNN tour? I'd taken a very similar tour of the same building many, many years ago and it's not changed significantly, except for the upgrade of studio equipment and sets. So, I probably will wait until a visiting friend or family member really, really wants to go. I'm glad I went…it's (almost) always cool to know what's going on behind-the-scenes. Fun post. I like how you also offer parking info... you're so thorough ;) Hope you're having a lot of fun making your way around ATL.